Adding the stairs to a loft conversion is one of the final tasks in the process of converting a loft. Having the right access to the loft space must not be overlooked when designing a loft conversion. 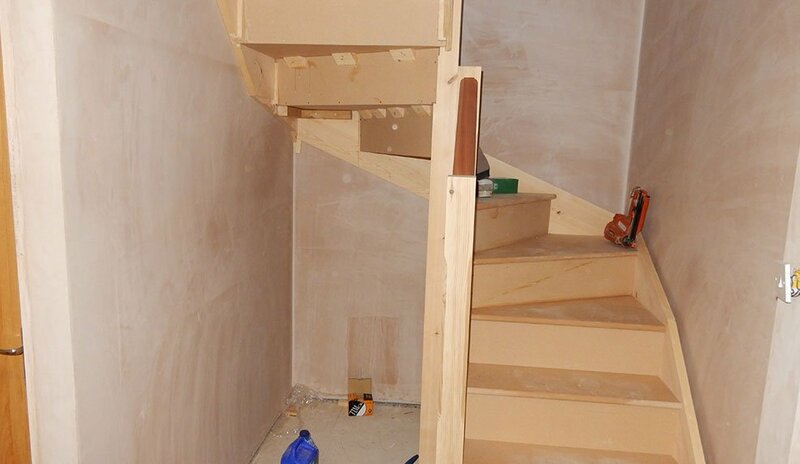 In this blog, we will be talking about the process of installing stairs in a loft conversion and some of the things that must be considered when adding a staircase. In our initial consultation, we’ll chat about the staircase with the homeowner to identify the design they believe will suit their property most. We often match the staircases with existing staircases in the household, however if the property is a bungalow we will identify the staircase that is most suitable for the property. Among the first steps of installing the stairs into the property, is putting the floor joists in place. The joists support each step and align the staircase. In keeping with planning laws, we have to incorporate the minimum head height of 2 metres into the installation and creation of the stairs. Safety is a concern, especially for families with small children. For this reason, any gaps (e.g. between balusters) have to be less than 100mm – to eliminate the risk of little ones getting their heads or bodies stuck. Our standard staircases are made from softwood but can be upgraded to hardwoods like oak. As part of the stairs installation, we apply fire-resistant plasterboard to them which also helps to lower water absorption. We can also take care of all of your carpeting needs. Here at Anglian Carpentry, we have over 40 years of experience in the loft conversion industry between us. This experience has led us to conduct our work in different ways to other loft conversion companies. We handle everything internally – from the design of your loft conversion to the decoration. Installing the staircase will usually only take one day, and this is the only time we will ever come into another part of your home. Check our coverage area to see if we can help? Interested in having your own loft space converted? We can help, call us on 01953 452269 or email us on enquiries@angliancarpentry.co.uk.